Hey everyone, today I will share Fab bag July 2017 Edition. 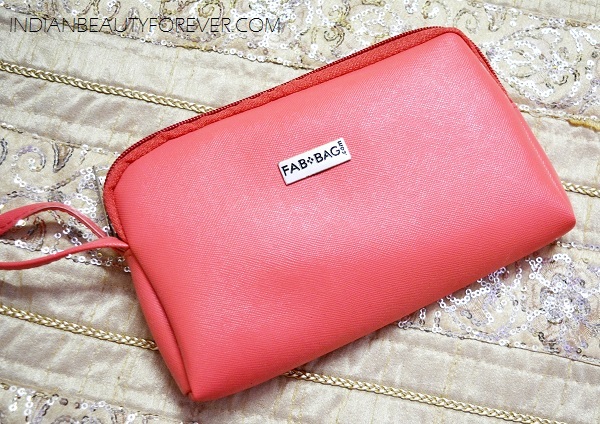 This month this is the The Colour Drama Fab Bag which is a beautiful peachy pink bag. 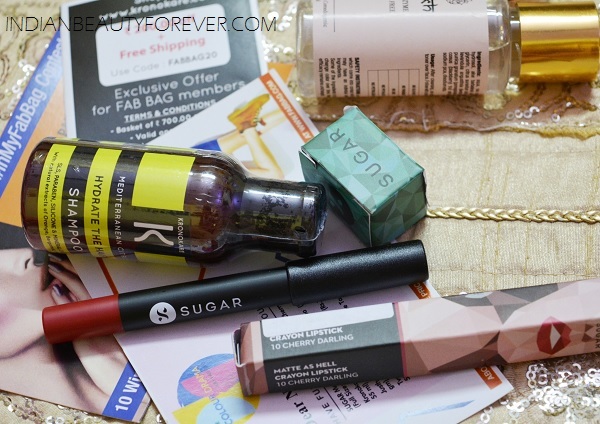 Let’s see which are the products that I got in this month’s bag. This is my third crayon lipstick from Sugar Cosmetics. I can’t say how much I like these lipsticks. They are rich, intense and matte. I have already done reviews of these. This time the shade I selected was Cherry Darling which by the name suggests that it is a nice rich deep cherry color. It is very Indian wedding appropriate color which I loved. 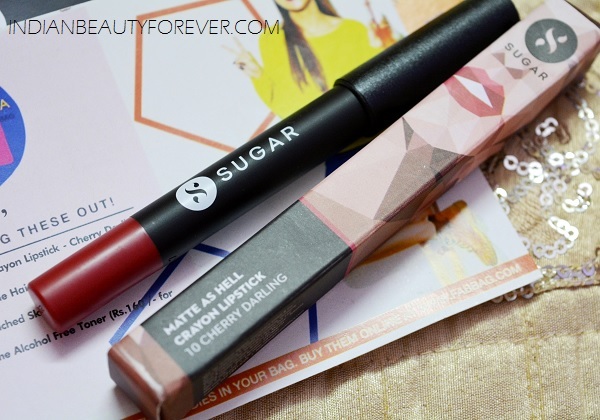 Price of this Sugar Lip crayon is 799 rupees. So, just think for 599 rupees, I get this product along with other products and the lovely peachy bag. I have used a lot of Just Herbs products so far and thanks to Fab Bag for sending me products when I won one of their contests. Anyways, this is a skin tint. 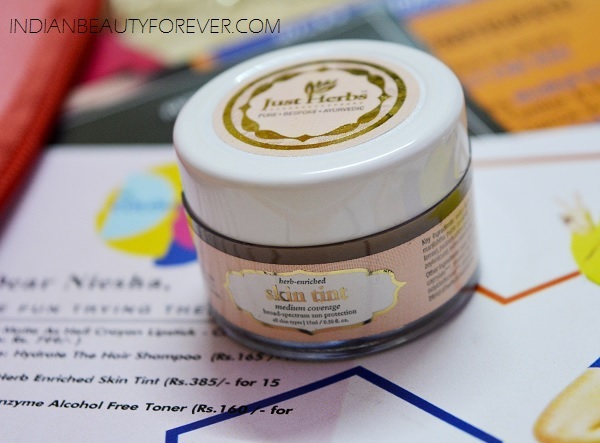 A skin tint is more like a skin moisturizer mixed with some tint or pigment that cover the minor flaws. Price: Rupees 385 for 15g. This month I got this new brand’s sample. I am new to this brand and it’s a skin toner. The toner is clear and water like. It says that it has fruits and rose water etc. I am going to use this at for sure as it looks quite promising. Let’s see how it turns. It’s a paraben free product which is good as many of us would like to go for paraben free skin care products. 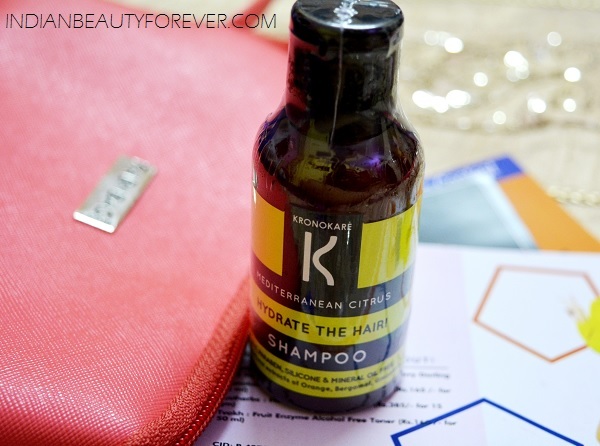 This is the Kronokare shampoo. I have used couple of products from this brand as well as this is quite good. I mean most of their products are promising and works well. This can be a part of your travel kit. I like to keep such small samples for travelling etc as they are not bulky like the bigger bottles and are also good for taking along. 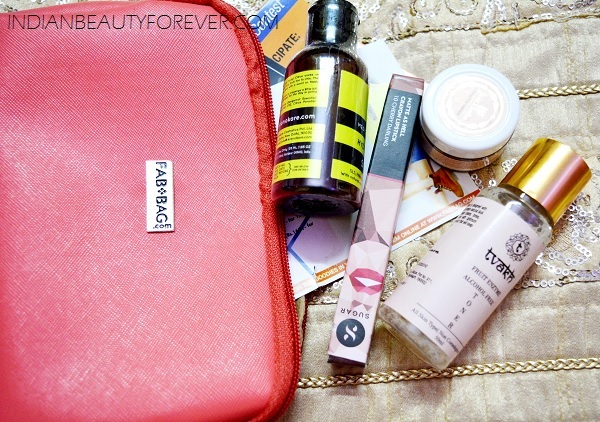 So, these were the products that I got in this month’s Fab Bag. Fab bag has always been my favorite bag. I would definitely is for you to subscribe for this Fab bag.